The Hither & Yon Socks are an easy knit, even if you’ve never added beads to your knitting before. I include a video tutorial to make it easy. If you aren’t in the mood for beads, you can leave them off and will have beautiful socks as well, for the stitch texture is gorgeous all by itself. This pattern, which comes in 7 sizes from small child to large adult, also includes detailed, illustrated instructions on knitting Sweet Tomato Heel Socks 2-at-a-time, toe up or top down, on 1 or 2 circs. If you wish to purchase my entire eBook, with 9 sock designs, for $20 (read below for more information), click here. 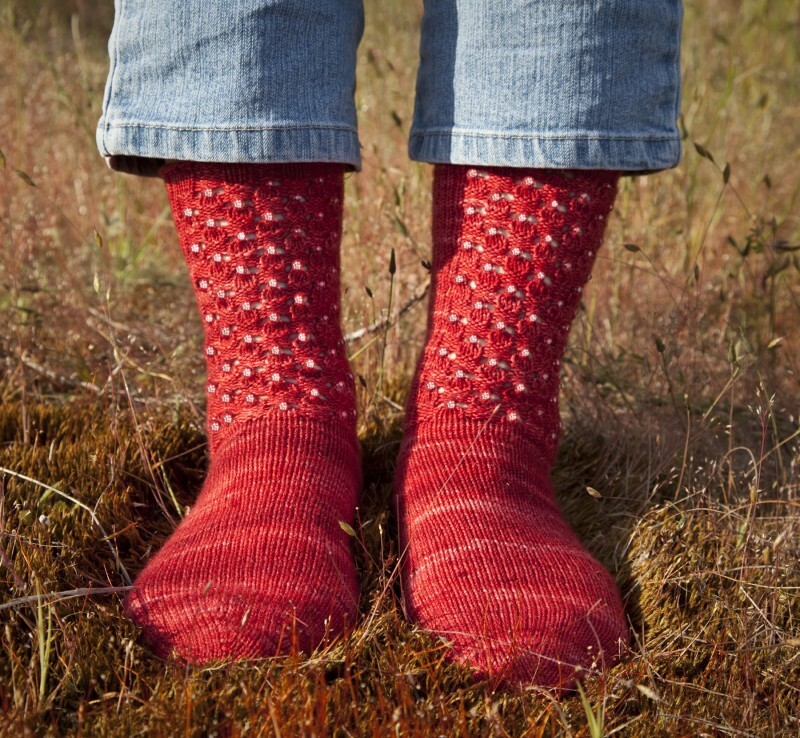 Or, if you prefer to buy just this single sock pattern for $6, click here. You will have the choice of paying by Paypal or by credit card. THe eBook can be read on any computer (desktop, laptop) or on a iPad, Kindle, or Nook. I’m offering the eBook like a slow-release vitamin — initially the cover, table of contents, the foundation lessons, and two or three socks. Then every month I’ll add one new sock (as an automatic digital update) until the book finally completes itself with all eight to ten designs. Somewhere along the line I will also release the patterns as singles. All of this will happen on Ravelry and here, and probably also on Patternfish. The book will be laid out like my other books, with lots of illustrations, photos, charts, schematics, line-by-line instructions, and also live video links. A reader can print just the pages needed for a pattern, or work beside a laptop or iPad (which also allows charts and images to be stretched so details pop).